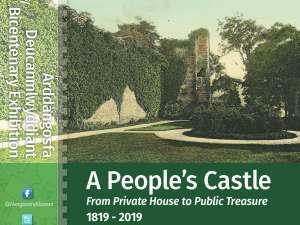 A People's Castle Exhibition at Abergavenny Museum and Castle ExhibitionThis year sees the 200th anniversary of the 2nd Earl of Abergavenny having the building which now houses the museum, constructed - it was known as Castle House. The building soon housed tenants and the grounds were used as kitchen gardens and an orchard. In 1880 the 5th Earl, who became the 1st Marquess of Abergavenny, handed over Castle House and the grounds including the Castle ruins to the Abergavenny Corporation for a peppercorn rent to be used as a place of recreation for local people and a destination for visitors. Rustic walkways were constructed, along with a bandstand, a dance floor, lawn tennis court and a large banqueting hall, formal planted areas and turfed lawns. The site was opened to the public with a grand fete in June 1881 and this heralded an era lasting until the First World War, of fetes and entertainments with fairground rides, swing boats and firework displays. This exhibition will enable visitors to find out much about this extraordinary era and what has happened since then – including the opening of the Museum, which also celebrates an anniversary this year – of 60 years. The exhibition has been curated by Sue Smith and Kay Celtel who contributed their time and talents on a purely voluntary basis. They wrote the information panels, selected images, approved the overall design and assisted with the installation of the exhibition. In addition, Kay worked with Gwent Archives to select documents for display, whilst Sue devised activities and digital content and identified objects from the Museum Collection. It has been possible to include such a wide range of information thanks to research carried out by Abergavenny Local History Society Research Group who spent many hours going through the archives at the Abergavenny Chronicle Office and to Katie Davies who arranged this research into themes. Once these themes had been chosen one of the museums regular volunteers Irene Hofayz spent many hours assisting with the selection of suitable objects from the museum collections. This exhibition will enable visitors to find out much about the history of our museum and the building it's housed – including the opening of the Museum, which also celebrates an anniversary this year – of 60 years.